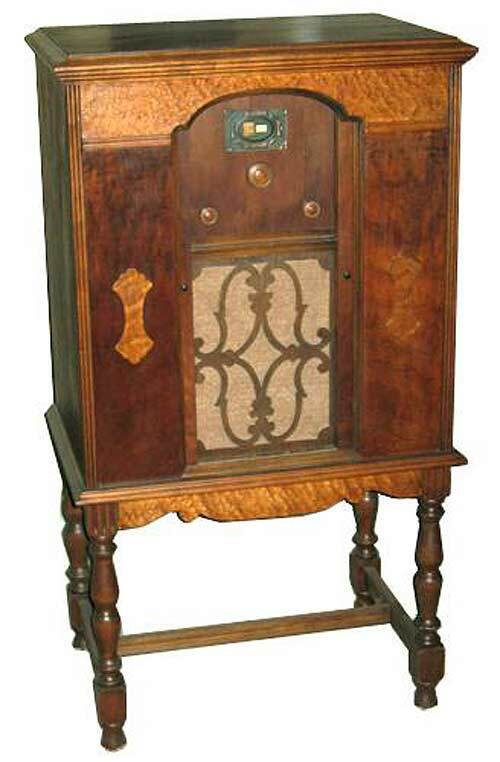 One of the few radios produced by the short-lived Thomas A. Edison, Inc. radio business before the company went bankrupt shortly after the stock market crash of 1929. 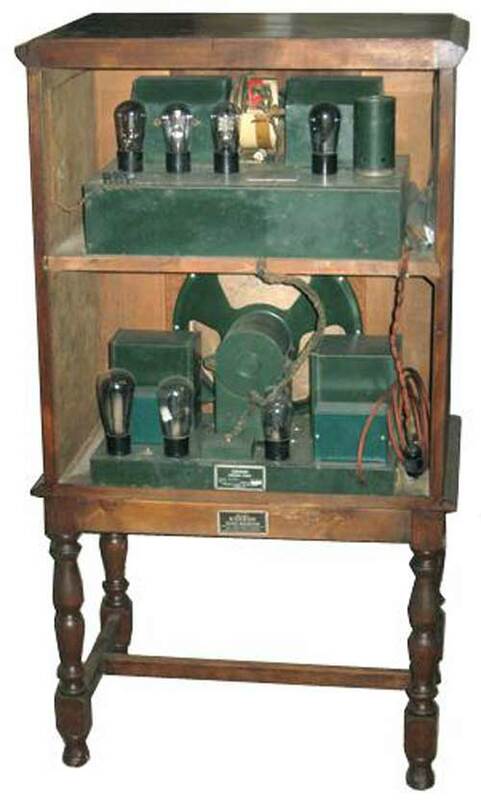 The R5 was the least expensive of the Edison radio line and is generally the most common today. 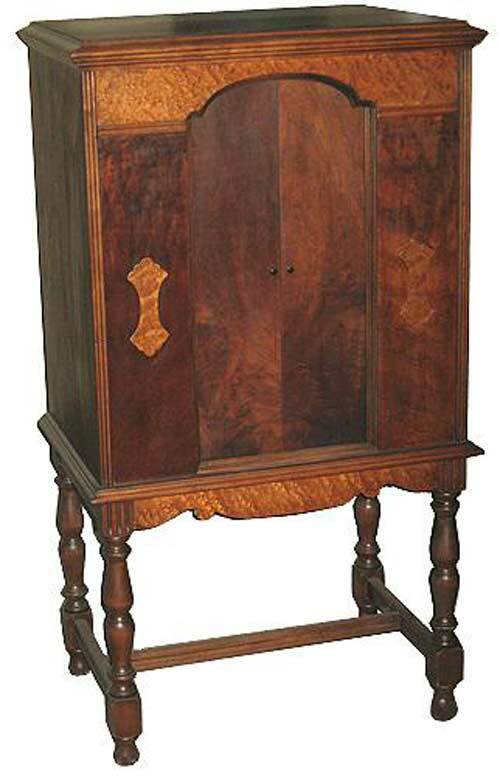 The two heavy and separate chassis sections of the R5 are encased in a beautiful walnut cabinet with high quality veneer and sturdy construction. The top chassis holds all the '27 tubes for a 4-stage TRF receiver followed by a pre-amplifier and the bottom chassis consists of the power supply, speaker, and push-pull audio output stages. The early 1929 version had the chassis painted dark green as seen in my example, and the later 1930 versions were painted gold. 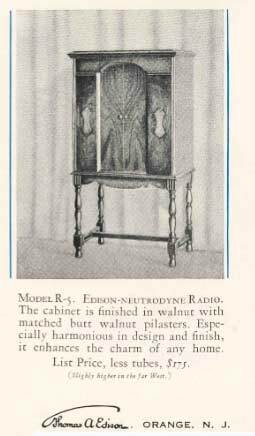 The R5 also sports a neat feature introduced on all Edison radios called the "Light-o-matic" that allowed the user to preset station positions and the dial would flash the station call name when tuned in place. This was achieved by using a copper strip around the dial cylinder. A key is inserted in the hole at the right of the dial window and turning it would indent the copper strip to make contact with a switch for illuminating the light bulb. The user could write the station call name on the rightmost white dial window and it would flash red when the station was tuned in place. Alas, I have never actually seen this feature in operation on mine as the components for the "Light-o-matic" mechanism were missing including the unobtainum key. The R5 originally sold for $175 as seen in a snippet from an Edison brochure below.